- Mr. Ambassador, as you told us already, you are going to leave in September and what do you think is your main achievement as Ambassador? - Well, I don't know about achievements. I have a bunch of disappointments, as you'd imagine, in the bilateral relationship. But you know, we try very hard at this Embassy to stay in contact with Russians throughout the country. I travelled a lot. And we continue to build what I call people-to-people diplomacy and I think I lot of that was important, and that's certainly what our Russian friends and colleagues say to us. We supported American business here. We tried hard to build contacts between scientists and others as well as other educational institutions. The big issues that are the most disappointing are the big political issues, obviously. It would have been nicer if there had been some kind of solution on the Minsk Agreement in Ukraine. We've had some cooperation in Syria, but still there's a long way to go there. So it's a mixed plate of different things. But we worked really hard. We tried really hard. - Can I ask you a philosophical question? We had great expectations when Trump became president. I don't know why, but all Russians seemed to believe that now a new era emerged in our bilateral relationship. Why do you think relations instead of improving deteriorated? - I think there are some very serious problems. Ukraine is one of them. In Europe and the United States we believe that Russia invaded Crimea and that it fomented this effort in the Donbas and that's why sanctions were imposed and why people feel strongly about this. The Normandy Group with support from us has tried to move things forward but hasn't succeeded. Yesterday in Minsk Mr. Surkov met with our new special representative for Ukraine Kurt Volker. I don't have a readout of those discussions. I saw the statement that was made by Mr. Surkov. But our hope is to try to help find a way forward on that process. We also have obviously a very serious problem with Russia's cyber attacks against the United States' elections. This is what triggered the sanctions that came back recently. And it's something that is deeply, deeply felt in the United States. All you have to do is look at the votes in the Senate and the House - almost unanimous - to gauge how strongly people in the United States and their representatives felt about this. It's a very big mistake I think. - As far as I know there is no proof that these attacks took place. - All of our intelligence chiefs said it was there. Now, this line about proof: the KGB (the FSB) wouldn't provide proof if there was something they were asked for too, so that's not a real answer. I know all you have to do is look at the video when they had lined up Mr. Pompeo of the CIA, Admiral Rogers, General Clapper. All of them have looked at this. The Senate and the Congress have been briefed on this, and they almost voted unanimously. So I don't think there's a question here. 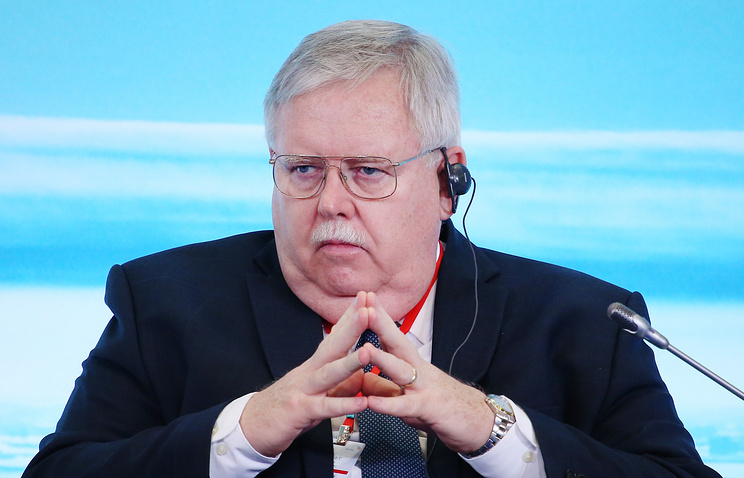 - Mr. Tefft, yesterday the US Embassy published the decision to suspend issuing visas to Russian citizens until the 1st of September and then it will be possible only in Moscow. So how can you explain this decision? Is it only a technical problem? - This is simply because we've been told by the Foreign Ministry that we have to cut down our staff to 455. And so we're in the process of doing that right now And the only way we can do this is to - when we do visas, it's not just a question of visa officers. It's all the processing. It's the security. And so the only way we can do this - it's not about being vindictive. It's about being able to do this properly. And we will start again on September the 1st. And it's unfortunate but we don't have any choice because we have a lot of responsibilities here. The government is requiring us to have fewer people to do them. It's as simple as that. - But as Ambassador you put in great effort to push our cultural cooperation, our scientific cooperation. And don't you think that this decision will influence the possibility of cooperation? - I don't think so. I don't think it will. You know, this is a new world we're entering here. We're going to have to see how it goes. And if there are special cases we'll take a look at those special cases to deal with them. So I wouldn't make any big judgements about impacts until we have actually a chance to see how it works out once we've started down that road. - Which special cases do you mean? - What you're talking about. You mentioned scientific and others. You know, if there's some professor who needs to get to the United States for some urgent consultation or something, I think our people will find a way to get him a visa to do that. That said, it's going to be very hard, because we just don't have enough people to do the job. We were already getting increasing numbers of Russians who wanted to go even before this. And the pure volume - it's literally numbers - the volume goes up and the Foreign Ministry has reduced the number of people we have to be able to service those people. - I didn't say 755. I said we were told to be at 455 by the Foreign Ministry. - Let's not get into numbers. Numbers have to be worked out, and we're complying with what the Foreign Ministry told us to do. - And it was also said in the message that was published yesterday that the Embassy already began the reduction of staff. So do you already have the lists of people who will have to leave? And does it affect Russian citizens? - It does. We have already had a number of Americans packing their bags who will be leaving to go back to the United States. There are Americans who have been preparing in Washington, studying Russian to come out here, and they're not going to come. And there are going to be a lot of Russian employees, who, because of the Foreign Ministry's decision, we're going to have to terminate their employment. It's not something we want to do. It's something the government is telling us to do. And it makes me feel personally very, very sad. Because there are people here who I've known for 20 years who are not going to have their job. It just doesn't seem right. But I don't have any choice. It makes you heartsick. - When Russian diplomats had to come from Washington and New York there was a special plane, as far as I remember. So, will there be the same procedure? - I don't think so. We're trying to get people who are going back to the United States on planes before September 1st, which is the date the ministry gave us. So I don't think we're going to have special planes. - So do you think by Sept. 1st you'll be able to reduce to the 455? - That is our plan. That's what we're planning to do. - Yesterday, Mr. Antonov was appointed Ambassador to the United States. I believe that you know him. - What is your opinion about him? - He's a very professional diplomat. I and many other American diplomats know him. I know him mainly when he was the Vice Minister of Defense, but many other Americans know him because they were across the negotiating table on arms control negotiations with him. So we know him well and wish him well in Washington. - Maybe you have some advice for him? - No, he is a very experienced man. He'll know what to do, I think. - Will you hold a meeting before he goes? - I've offered to meet with him, but so far we've not been able to set up something. It's his decision, not mine, at this point. - When can we expect Mr. Huntsman to come to Russia? - Well, we don't know for sure. The TASS correspondent in Washington filed a report back August 31st and he had talked to Senator Corker, chairman of the Senate Foreign Relations Committee, and Senator Corker as I remember the article in TASS said that after the Senate comes back - I think that's Sept. 5th - there would be a hearing for Ambassador Huntsman. That he expected him to be approved by strong vote on both sides and to come out here quickly. So I can't give you an exact date because I can't control the confirmation process. But I know Ambassador Huntsman's looking forward very much to coming to Russia. I would also say that from where I sit, Russia's very lucky to have someone like Ambassador Huntsman come. This is a man of really broad skill and deep experience. You know his biography. The man has been a presidential candidate. He's been governor of a state twice. He's been Deputy Secretary of Commerce. He's been ambassador in China and ambassador in Singapore. I think he's going to be a great ambassador here. And again I think Russia's very lucky to have someone of his caliber coming here. - But it's safe to say that you're more experienced in this region, and maybe you will have a talk with Mr. Huntsman. - I expect I'll have dinner with him or something when I go back. I'll leave a little early and then my wife and I will see him and his wife. He may not be a Russian expert, per se, but this is a man of broad experience. He's currently the chairman of the Atlantic Council which is one of our most prestigious think tanks and foreign policy groupings. And I know he knows a lot about Russia already and I know he's also preparing very carefully. Every day we hear, he went to NASA yesterday, or he went to the White House, or he went to some other briefing with people. He's working very hard to prepare himself. - During this meeting, on which points would you recommend him to focus? - That's going to be between him and me. - Generally speaking, in which spheres can we still have good cooperation in our countries? - I think we have to solve the big problems. There's no other solution. We can have some smaller areas where we can make some progress, but I think those fundamental ones we talked about before -- we have to solve the big issues if we're going to get the overall relationship back on the track that you're talking about. - So I mentioned that to solve big issues we need dialogue between our foreign ministers. Talking about this, is there a possibility they'll meet at the General Assembly? - Of course there's a possibility. There's been no, as far as I know, anyway, there hasn't been any preparation or agreement on time or anything like that. We still have plenty of time to set that because isn't that the third week of September they'd be in NY? So we'll see. Isn't it the 23rd or 24th of something like that? Anyway, there's nothing set yet, but you know, most of the time the Russian and American foreign ministers meet at the United Nations, so we'll see. - Maybe there will be a meeting between Ryabkov and Shannon before that? - It's possible, but I don't think we're in a position yet to confirm that as far as I know. - Can I go back to the visa situation? I wanted a couple of things to ask. So, this was a topic about Belarusian citizens who usually apply for visas in the Moscow Embassy. So now, will they be allowed to do so after September 1st? - No, we will not be able to take Belarusians. They will have to go to another embassy like Warsaw or Kiev or some other to apply to get their visa. 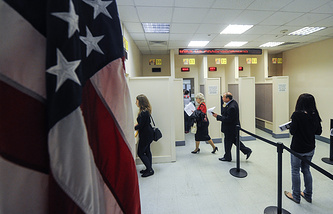 - It's the same as it was - if they are Russian citizens, they can apply for a visa here in Moscow. If they have a Russian passport. - Are the US and Russia still discussing the possibility of prolonging the treaty on the reduction and limitation on strategic arms? - There's not a current discussion on it. It comes up sometimes in the larger discussions but there's not a specific on-going negotiation. Do you understand my point? It's not like they're meeting regularly every week on those things. But the issue comes up. - I mean, is this issue still on the agenda of our relations? - I would say, probably, yes. We've got a lot of other issues. And that's a very serious issue. - What do you mean by Russian violation? - Russia developed a cruise missile which we are confident has exceeded the limits of the INF treaty. In other words, Russia has violated the INF treaty. And we take violations very, very seriously. And we've had discussions with Russia about this and Russia needs to address this issue. Needs to fix the problem. - In your opinion, how long will this period last between Russia and the US - how long will we be in this sanctions war and is it possible to put an end to it? - I think if Russia is willing to implement the Minsk Agreements with Ukraine, we could - we've said it before, the previous administration said - not the Crimean sanctions, but the other sanctions could be lifted. I think that's the Trump Administration's view too. Which is why it's so sad that this has gone on for so long. We believe it should be addressed - use the framework of the Minsk Agreement and move on. That's why we've appointed Kurt Volker, one of our very talented and experienced diplomats, to be our interlocutor with the members of the Normandy Group and why he met yesterday with Mr. Surkov. - Just after these sanctions against Russia were enacted, it seems there is no turning back. - Well, there's always a way back. You can always fix the problems. But Russia has to take steps, as Secretary Tillerson has said, to solve the problems in Ukraine. He's made this very clear in person and in the press that Russia needs to be the one to take the initiative. - May I ask you a personal question? What will you miss about Russia? - I'll miss the opportunity to travel and see this beautiful country. Both the natural beauty, of which there is a huge amount, but also some of the great churches and kremlins and places that I've been able to go while I've been Ambassador here. I'll miss the music. I love the music. And one of the great pleasures for my wife and I has been everywhere, but particularly here in Moscow, we know a number of ballet companies. We know a number of the orchestras and the conductors. We've had the great privilege to host at Spaso House 24 different concerts during our time here. Actually, if you include 4th of July with our bands we're at 27. To provide our Russian friends a lot of American music. But by the same token we've enjoyed very much the Russian music and the many opportunities to see opera, ballet and different musical productions here. Also jazz. We have a wide interest, my wife and I, and it's something we'll miss a lot. - As you mentioned, you've visited a lot of Russian towns. Which one do you like the best? - I'm not going to get into which one I like the best. We had a lot of wonderful adventures traveling in Russia and meeting wonderful people. We've been from Svetlogorsk up on the border with Finland to Vladivostok, from Arkhangelsk to Sochi, to all kinds of places in between. To Irkutsk and Voronezh and Yekaterinburg and a lot of others. And we've tried everywhere we go to meet Russians and everywhere we've gone they've been very hospitable and friends to us. We'll miss that. - But you'll come back sometime? - Sure. I'll be back. I'll have to come back. One of my staff said the other day: no matter what it is, you'll have to come back for pelmeni. Because you know in one of the first interviews we did, on VKontakte I did, someone asked "What do you like the best?" And I said, "Pelmeni." Well, this went viral on the Russian internet. So everywhere I would go people would say "We have pelmeni" or "We don't have pelmeni." I love a lot of Russian food. But pelmeni is my favorite. - What are you going to do when you're back in the United States? - Well, I've got a number of family things that I need to take care of first. My wife's mother is quite sick, so we've got to be able to help take care of her. We'll do some family things first and then I'll think about whatever I'll do in my professional life. - I hope you will be able to find some good pelmeni there. - There's apparently a new Georgian-Russian restaurant opening in downtown Washington in the next week or two. My family told me about this and told me they'd take me there. I'll be back. You'll see me back in Moscow. - Thank you, it was a great pleasure to be in contact with such a great diplomat as you. - Well, you're kind. Thank you for saying that. Yeah, we'll be back. And you'll enjoy Ambassador Huntsman a lot. I think he's going to be a great Ambassador here.